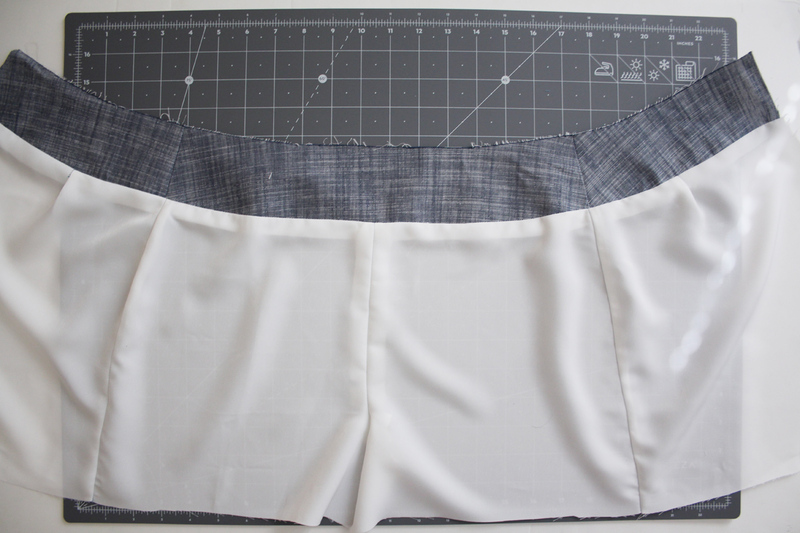 Now that the outer fabric of our Harper shorts and skorts are put together, let’s move on to the lining. 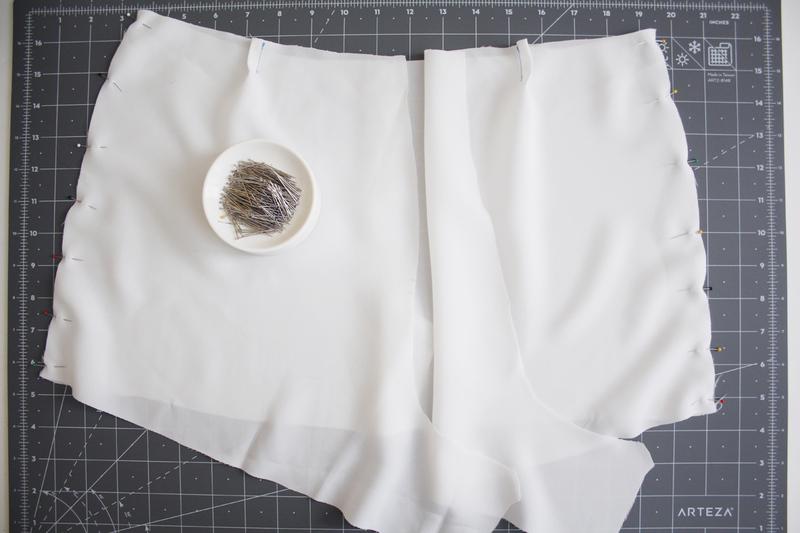 Fully lining a pair of shorts or pants may seem like a difficult task, but I swear it’s not! 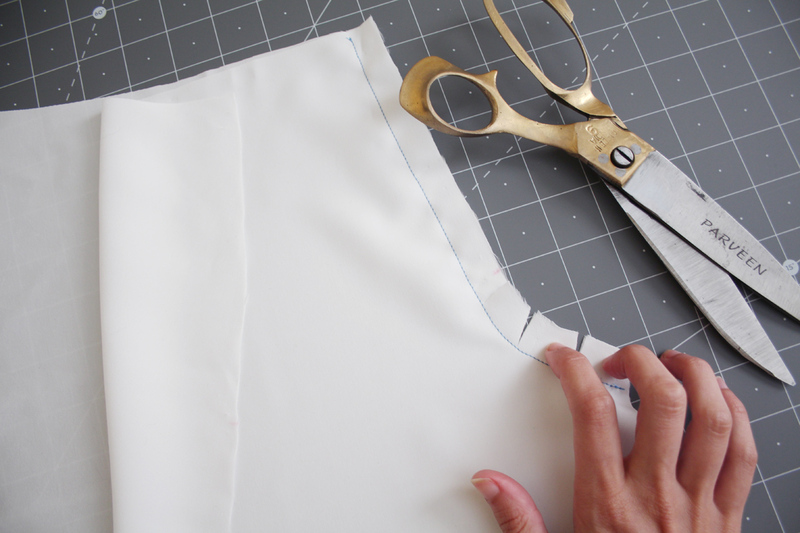 If you’ve never done a lining before – it’s just as simple as the outer garment. Literally, the construction is pretty similar, almost exactly the same. So let me show you, you can do this! 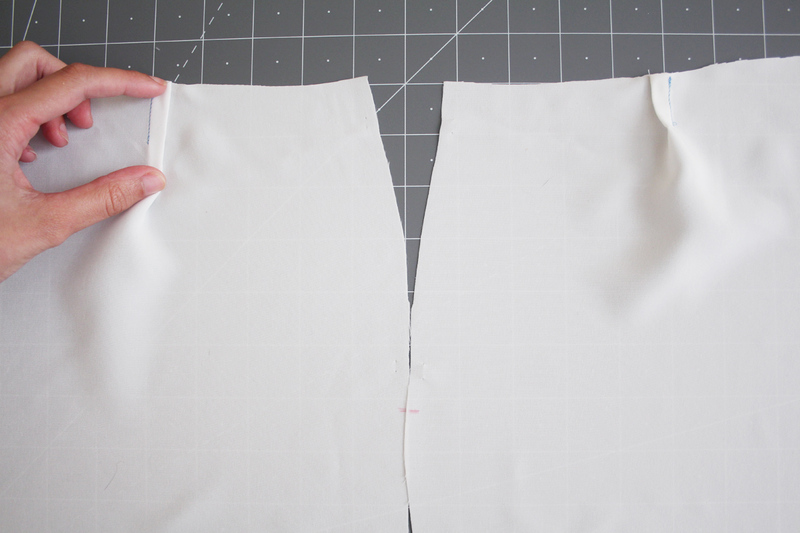 Remember, this step is for all versions, whether you’re making shorts, a skort, or another variation. It’s all done exactly how you see here. 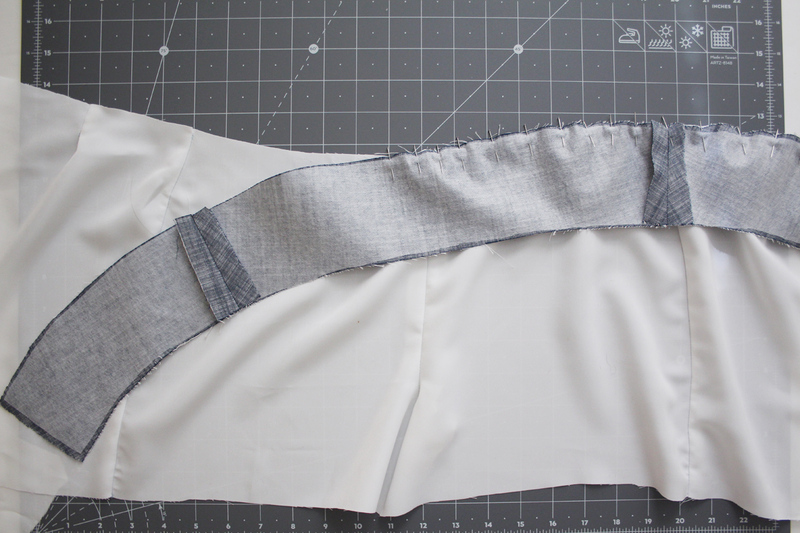 And stay tuned for the next post on how to attach your lining to the outer fabric. The lining will not have darts, but release tucks instead. The notches along the waistline of the back lining are exactly like the dart notches, so make sure you mark these notches on the back lining pieces. 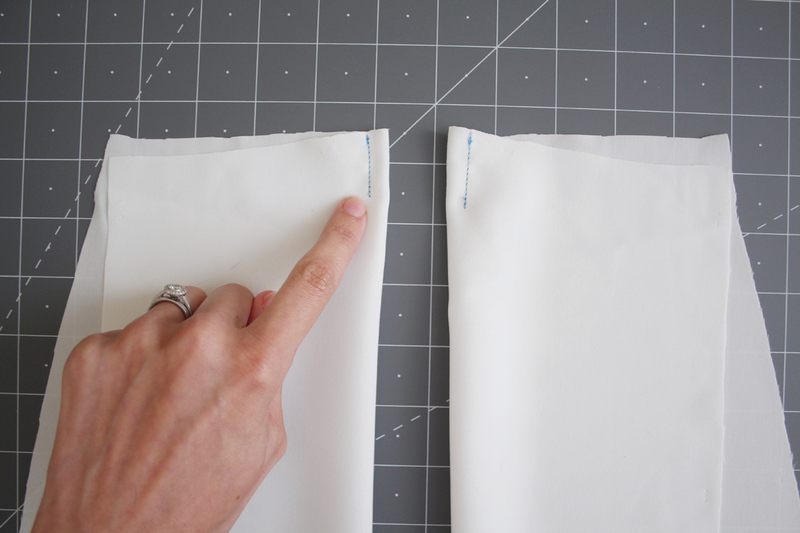 To sew the release tucks – fold the fabric over so right sides are together. Line up the notches. Sew straight down from the notch for 1″. Press the tucks towards the side seams. Set the back lining pieces aside for a moment. Now grab the two front lining pieces. 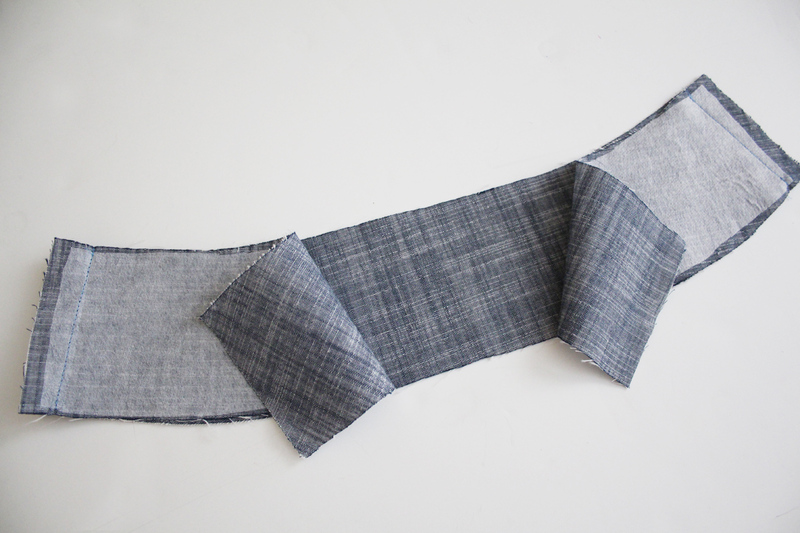 With right sides together, sew along the center front 5/8″ from the raw edge. 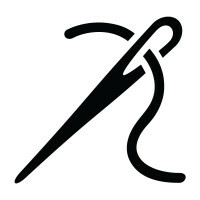 Clip into the curve, being careful not to cut through the stitches. 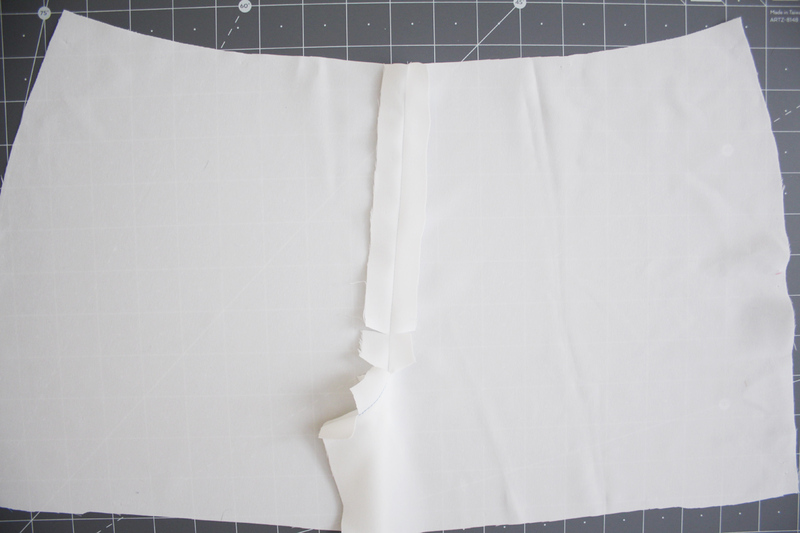 Because this is a full lining, it’s not necessary to finish the raw edge of the center seams. But if you would like to, now is the time to do it. Press the seam open (or to the side if you finished the raw edge). Flip your front lining over so now the right side is facing you. Lay each back lining piece down, so right sides are together, and match up the side seams. Sew the side seams in place 5/8″ from the raw edge. Finish the raw edges and press open or to the side. Lay your full lining out open. Now, I forgot to do this next step (whoops! ), but it’s important that you do because it’s really helpful when it comes to attaching the facing in the next few steps. 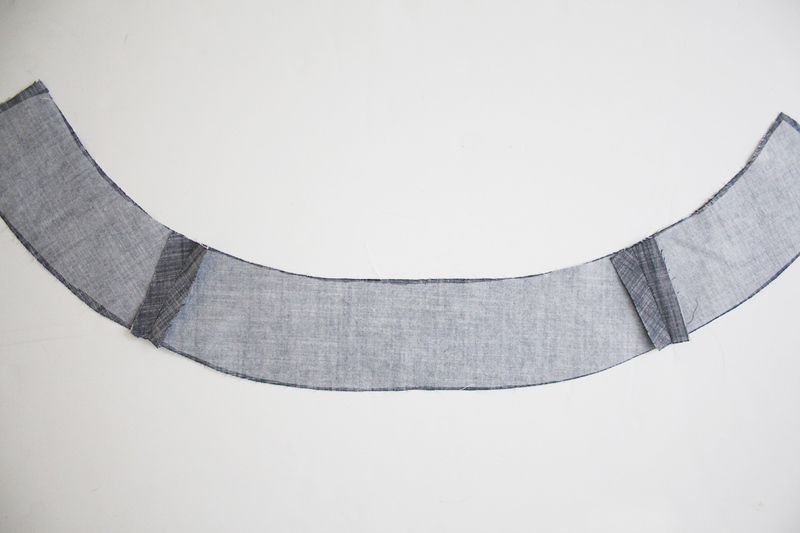 Sew a line of stay stitching along the entire top edge of the lining, 5/8″ from the waistline raw edge. Then clip into the seam allowance every 2″ or so, being careful not to cut through the stay stay stitching. Now set aside the lining for a moment. Move over to your facing pieces. 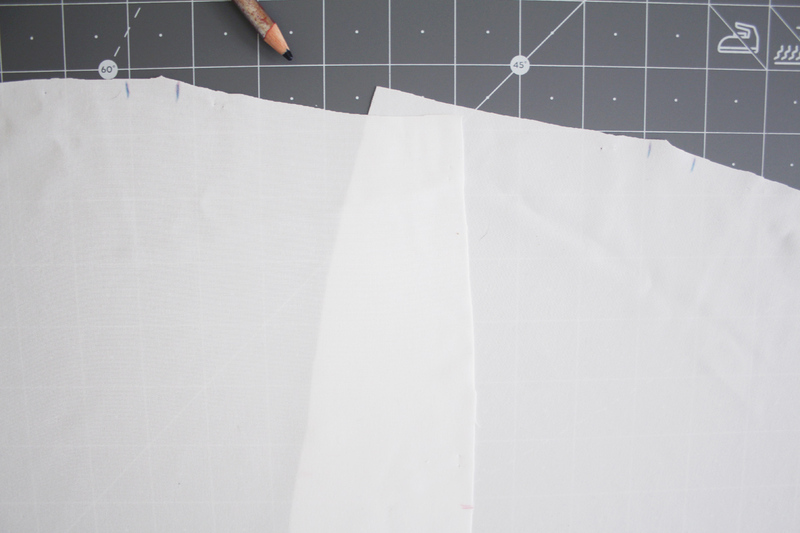 Attach lightweight fusible interfacing to each piece. With right sides together, attach the back facing pieces to the front facing at the side seams. 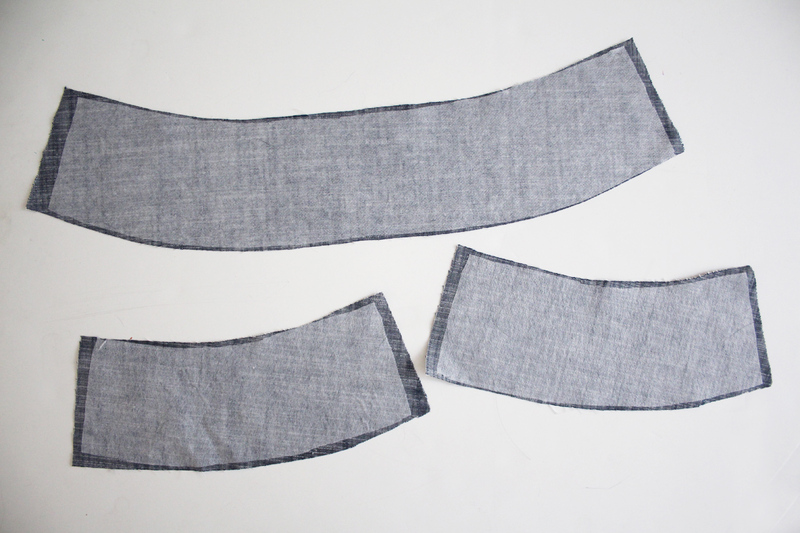 Sew 5/8″ from the raw edges. Press the seams open. It’s not necessary to finish the raw edges. Now bring the lining back over, and lay down in front of you with the right side facing up. place the facing down on top, with right sides together. 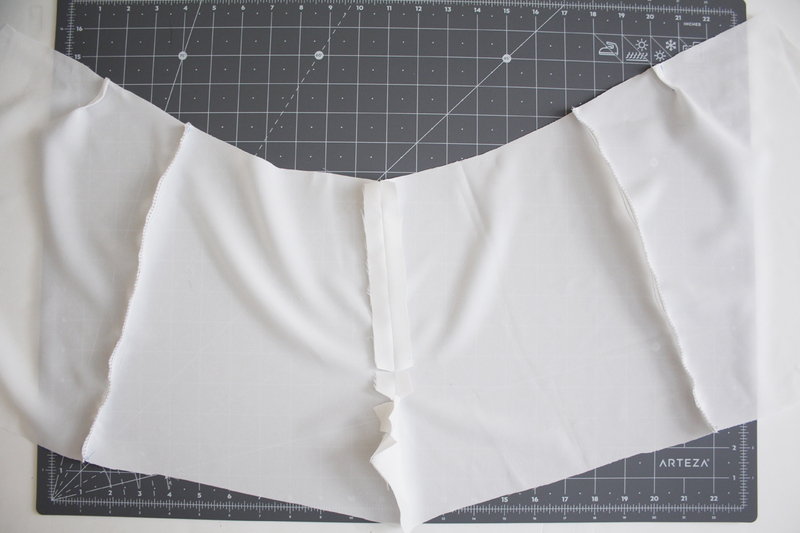 You need to line up the bottom edge of the facing (the lower curve) to the waistline of the lining. 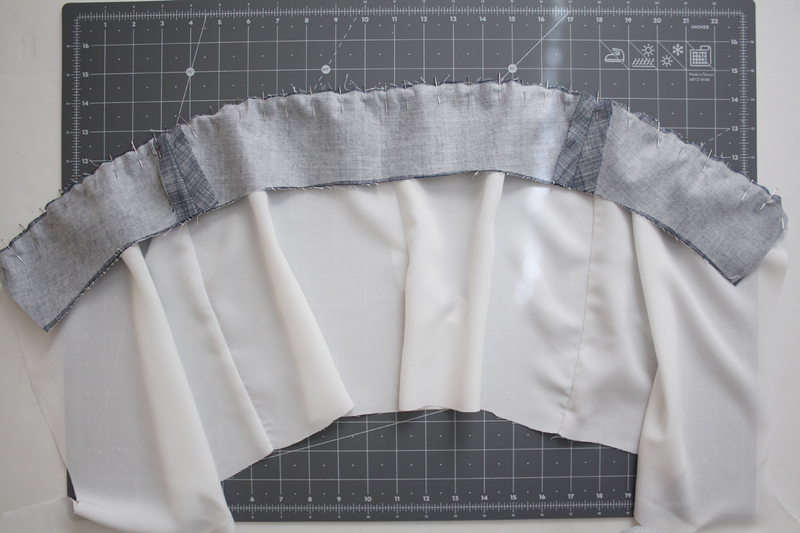 Match up the side seams and notches, and ease the lining into the curve of the facing, pinning as you go. This is where the clipping step that I skipped will come in handy, so don’t skip it like I did! 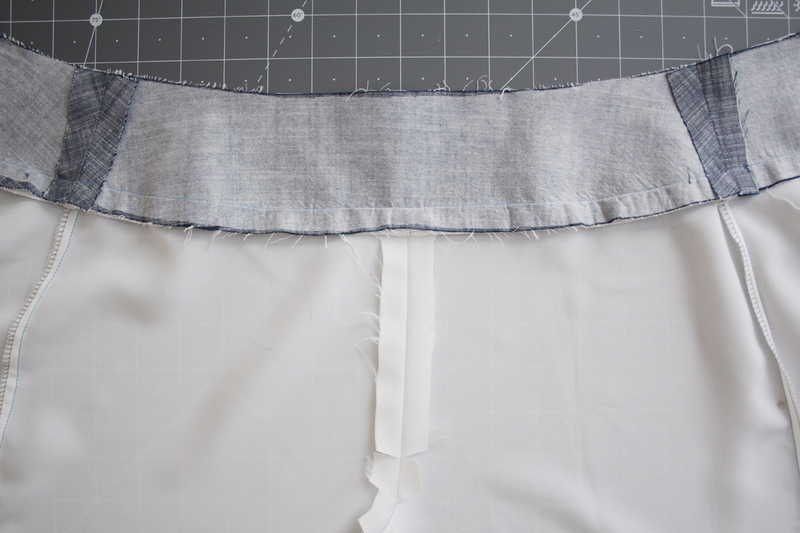 Clipping into the waistline will help it move and bend into the convex shape of the facing edge easier. Sew in place 5/8″ from the raw edge. Press the seam down away from the facing. This above photo is what it looks like from the inside. And this is what it looks like from the right side! All set and ready to be attached to your main fabric. 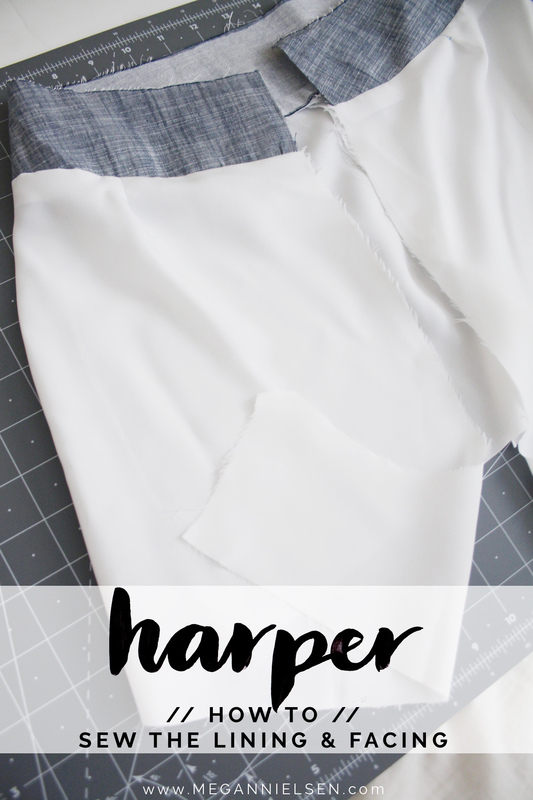 Don’t have the Harper sewing pattern yet?! Order Harper today! We absolutely love seeing what you make, so don’t forget to tag your creations with #MNharper and @megannielsenpatterns when sharing on social media, and check out what everyone else is up to!